[GURPS] March 13, 2019: Announcing Munchkin Warhammer Age of Sigmar! Thread: March 13, 2019: Announcing Munchkin Warhammer Age of Sigmar! March 13, 2019: Announcing Munchkin Warhammer Age of Sigmar! Mighty Battles for the Mortal Realms .*.*. The Perfect Chance to Kill the Monster, Steal the Treasure, and Stab Your Buddy! 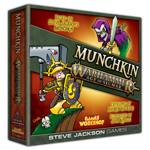 Austin, Texas [March 12, 2019]: Steve Jackson Games and Games Workshop brought Munchkin and Warhammer 40,000 together to create a perfect fusion of the two games with Munchkin Warhammer 40,000 .*.*. but there's a lot more to Warhammer than just one universe! The story continues with Munchkin Warhammer Age of Sigmar. The Eight Realms of Age of Sigmar form a new battleground for Munchkin players to explore &ndash; by which we mean kill monsters and take their stuff, obviously. First launched in 2015, Warhammer Age of Sigmar has found a home on game tables worldwide. Its rich story and variety of foes are a perfect match for your Munchkin game. Illustrated by principal Munchkin artist John Kovalic and designed by Munchkin Line Editor Andrew Hackard in close consultation with Games Workshop, Munchkin Warhammer Age of Sigmar is completely compatible with Munchkin Warhammer 40,000 and its expansions .*.*. create a truly epic battle by mixing the sets! Munchkin Warhammer Age of Sigmar will launch late 2019 in our premiere Deluxe format ($29.95), followed by two 112-card expansions ($19.95) in 2020. That's nearly 400 cards of additional Munchkin Warhammer fun! Steve Jackson Games, based in Austin, Texas, has been publishing games, game books, and magazines since 1980. SJ Games recently released the Munchkin Collectible Card Game, based on its best-selling game Munchkin. Other top sellers are Simon's Cat Card Game, Zombie Dice, and Illuminati. Past hits have included Car Wars and the GURPS roleplaying game system. Steve's very first game, Ogre, originally published in 1977, has been recently released as a video game on the Steam platform, bringing a tabletop classic to a new generation of fans. Games Workshop&reg; Group PLC (LSE:GAW.L), based in Nottingham, UK, produces the best fantasy miniatures in the world. Games Workshop designs, manufactures, retails, and distributes its range of Warhammer&reg;: Age of Sigmar&reg; and Warhammer&reg; 40,000&reg; games, miniature soldiers, novels and model kits through more than 507 of its own stores (branded Games Workshop&reg; or Warhammer&reg;), the www.games-workshop.com web store and independent retail channels in more than 50 countries worldwide. More information about Games Workshop and its other, related, brands and product ranges (including its publishing division 'Black Library' and its special resin miniatures studio 'Forge World') can be found at www.games-workshop.com. Warehouse 23 News: Munchkin Starfinder! Get your Munchkin Starfinder on! We have Munchkin Starfinder, Munchkin Starfinder 2 - Far Out, and the awesome Munchkin Starfinder "I Want It All"*box, all for order right now! Start zapping those pesky Space Goblins and get to level 10 with an order on Warehouse 23!